In an excerpt from his blog, (one of our 24 Best Travel Blogs and Websites), illustrator, photographer, and perennial road-tripper Erik Gauger makes a case for slowing down on shorter road trips closer to home. 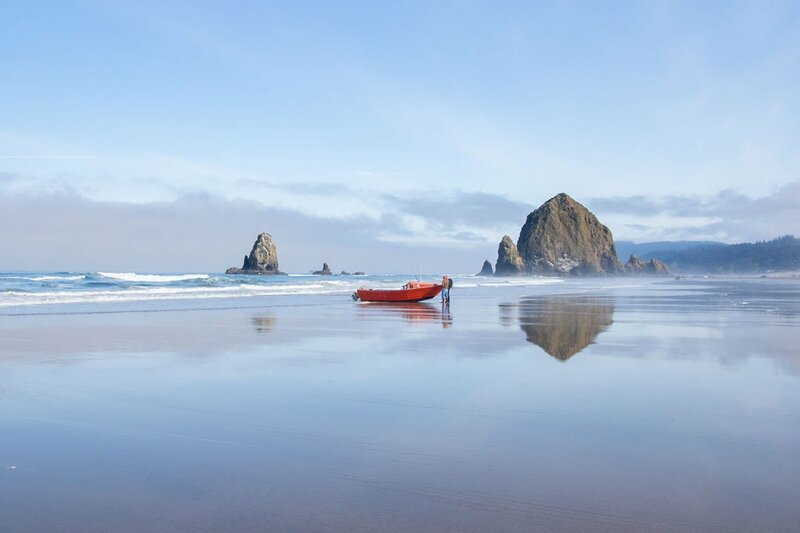 CLATSOP COUNTY, Oregon – I am at rock-strewn Indian Beach, a well-known Clatsop County, Oregon, surf spot between Cannon Beach and Seaside, of which explorer William Clark once commented, "the grandest and most pleasing prospects which my eyes ever surveyed, in front of a boundless ocean." If you time your arrival to Indian Beach during a low-spring tide, you can walk around the tidal rocks and make your way along almost completely isolated beaches. At exceptionally low tides, like the one tonight, you can walk out onto a series of rocks and ledges that are otherwise deep underwater. When you make it to those rocks and ledges, that tidal pool world of brilliantly colored ochre sea stars, gooseneck barnacles, purple urchins, and sculpin fish comes alive. To peer into the Pacific Ocean, connected in so many ways to the abyss beyond — coconut palm islands, Arctic shores, and orcas — is to remind myself that I am far away from where I grew up. But I am not far away from home, because after sixteen years of road trip travel, I realize this idea of taking home with me has been the habit that keeps me on the road. Today, home is parked at the Indian Beach parking lot. One of the weirdest things about writing road trip travelogues sixteen years ago, back when there were only a handful of travel blogs, was getting emails along the lines of, "You've inspired me to take a road trip across the country, and then into Canada, and to Alaska! I'm leaving next month!" What could I have done to inspire them? I had never cared for such a trip nor written about one. I would write back excitedly, asking them to keep in touch and let me know of their progress. Sometimes, I would check in, writing, "Are you in Canada yet?" I would never hear back. Every time, the radio silence gave me dark thoughts. Had I written something that made someone travel on an overly ambitious route, and they're dead in a ditch somewhere? Now, I understand that they probably never left, or that their road trip was miserable, and they gave up early, never wanting to have anything to do with it again. Today, the Internet is filled with stories about The Ultimate Road Trip, urging us on various transcontinental routes, maximizing sightings in the most efficient route possible. We're always talking about the road trip as an extreme, as a bucket list necessity. We also talk about our road trips in advance, putting up our routes on Facebook before they happen. When we memorialize road trips in movies and literature, we focus on the hardship, with the road trip as a kind of elixir for an unhappy life in a cubicle or a chrysalis after a relationship crisis. I don't need drama and extremes in my road trip stories. What I want to know is, how do you do it? How do you stay on the road comfortably, happily, and successfully? 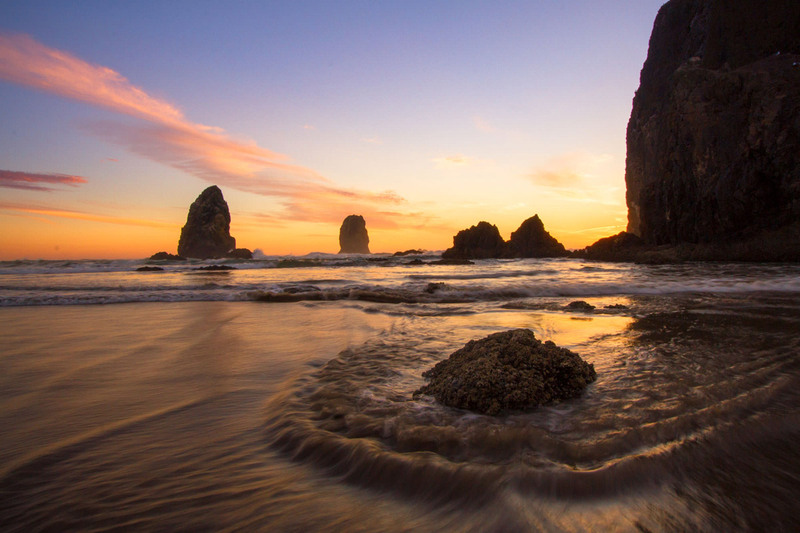 Haystack Rock by Cannon Beach. Today, I'm driving with my family on the ten-mile length of drivable beach between Gearhart and Warrenton. I see a bird sitting on the beach up ahead, right next to the tide line, and we circle it. It's a beautiful horned grebe in its spring colors, obviously injured and near death. Dead birds are common on the Oregon coast, especially after winter storms, which can catch seabirds far out at sea off-guard. 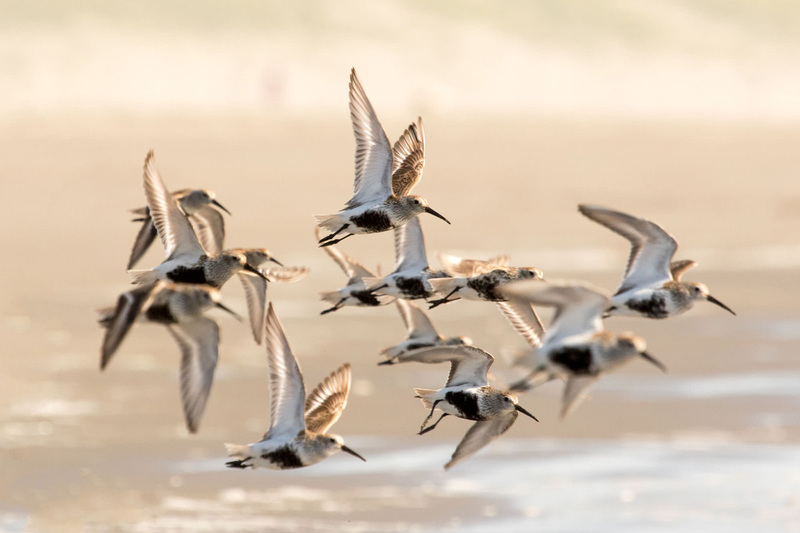 This year's mild winter was different, though, because dead seabirds were washing up on the beaches of Clatsop County by the thousands, in one of the biggest seabird die-offs in recorded history. I assume that whatever had been killing off those seabirds had doomed this grebe as well, and I drive on. It's expected to be the world's most vicious El Niño in recorded history, and that affects the food sources way out in the Pacific. Jane suggests, however, that we call a wildlife rescue center. At first, I ignore the idea, seeing the unlikelihood of anybody coming out to bag an injured grebe on the middle of a lonely beach. Jane asks again, and I find the number of a rescue center out of Astoria. Surprisingly, somebody answers. "We'll send someone right away!" But even then, I didn't believe anybody would actually show up. When we are two miles down the beach, I see a truck driving peculiarly close to the tide line. I study the truck with my binoculars and can faintly make out the driver. "She looks like a wildlife person!" I tell Jane and run down the beach to flag the driver. She rolls down her window. "You must be the one who called in. I can't find the bird." I suggest that I join her and jump in her truck. We barrel back down the beach, and right there along the tide is the dying bird. We pull up to it, and the lady hands me a cardboard cage. A few seconds after that, she's throwing a towel over the bird. It jumps to escape, and she somehow slips it into her hands. The bird responds violently, fight-for-your-life violently, by striking her wrists with its powerful beak. A few more seconds, and she's slipped the bird into this cardboard cage and it's in the back of her truck. "I could feel this fella still has a lot of weight on him. He's in pretty good shape. He's gonna live." I say goodbye to the woman, who drives off victoriously in her truck, and I start back towards my family. The last thing I imagined would happen today would be to witness this dance between bird and rescuer and to be able to explain to my son that this horned grebe may someday father a new line of grebes after it's carefully nursed to health by volunteers. But that's the way the road trip always seems to work. If you relax your schedule, forget about bucket lists and hauling madly between sights and experience, the experience comes to you. 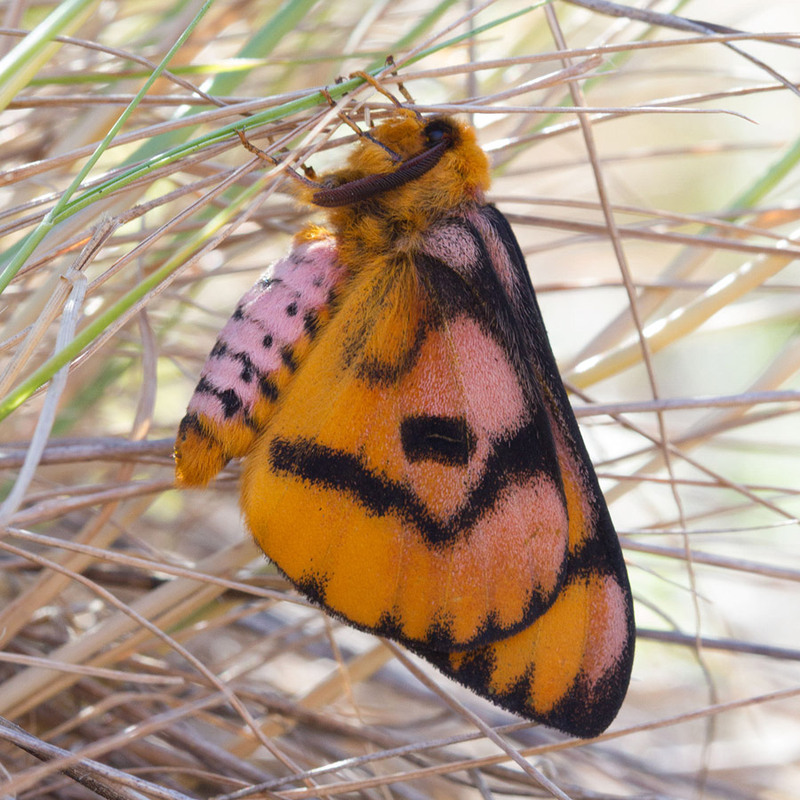 A western sheep moth in the coastal mountains near Cannon Beach. The next day, I am in a beach parking lot, cleaning up the Jeep, when I notice a man with a handgun holstered in open sight. This is one of those times when I shouldn't open my mouth. So I approach the man and open my mouth, asking if that's a toy gun on his belt. The man has one of those big pumpkin heads, and, when I look at him in the eye, I sense rage. He's wearing blue jeans though it's one of the warmest days on the Oregon coast in recorded history. "No, this is not a toy gun," he tells me. "But how can this place be open carry?" I ask him, looking at the hordes of beachgoers, the winding hiking trails, the children playing with beachballs. "Oregon is an open-carry state," he says, looking angry at me for asking. "You should get a slingshot instead," I tell him, "More fun, less intimidating. Look at all those families out there. It's not like that's a hunting rifle. Your presence with this gun will scare a lot of people." This is where he looks away, refusing to acknowledge me. Later, I see him at the beach, among the crowd of families. A woman, also in jeans, stands besides him, holding a Doberman Pinscher on a leash. The dog is high strung, thrashing madly against the leash and barking at the other dogs on the beach. This causes agitation among the dogs and one breaks free, racing toward the Doberman. The dogs snap at each other in the air, and people scatter. I look closely at the man's gun holster. It's not there. Did I get to him? 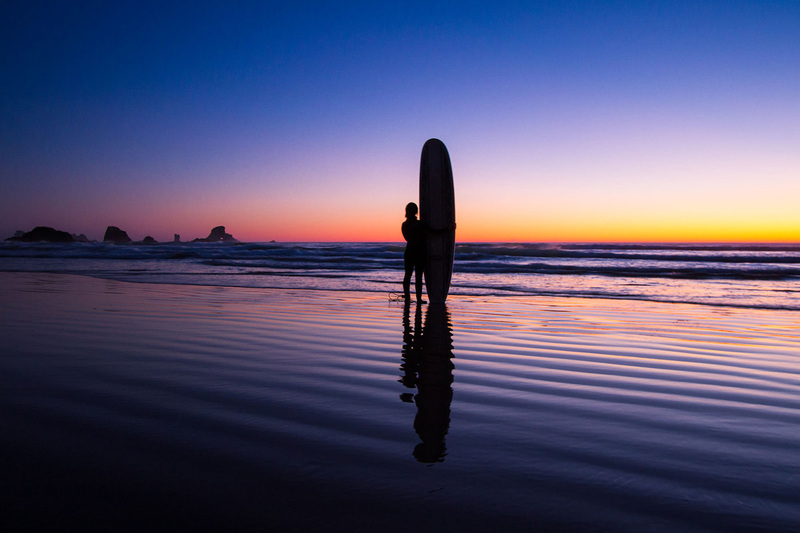 Culture changes quickly when you leave the city, and the beach subcultures of Clatsop County are profoundly different from Portland. It's a reminder to me that there is something to be said about going slower on the back roads of your own region, as a travel strategy, rather than attempting the epic road trip far away. 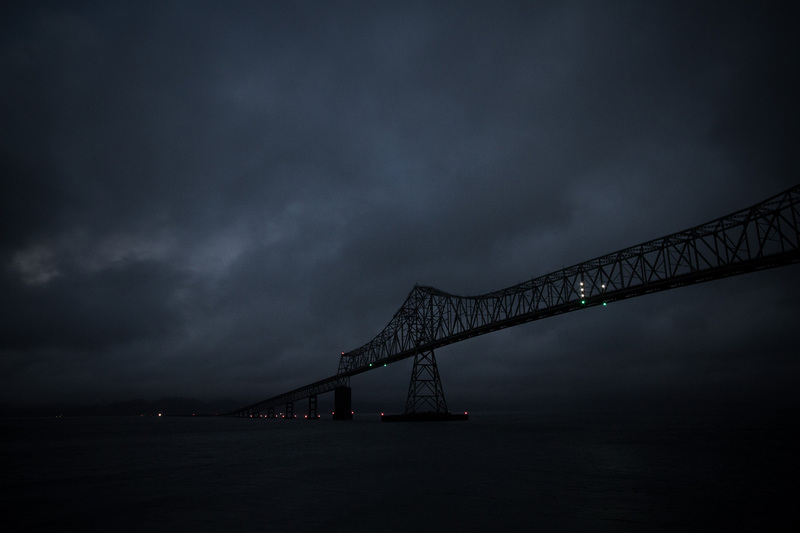 The Astoria-Megler Bridge in Astoria, Oregon. I've been trying to live by this axiom by exploring the mazelike coastal logging roads of Clatsop County. For the past several years, I've been driving deeper and deeper into the woods on these little-used routes, often with a birding friend, looking for quail and grouse. It was on these regular trips, winding about through dark forests that I realized how at home I felt completely isolated from the main thoroughfares to the coast. I owe this comfort on the road to my first Grateful Dead shows. My first shows were at the Sandstone Amphitheatre in Bonner Springs, Kansas, in the summer of 1991. While Dead venues were getting larger and larger, the Sandstone Amphitheatre had a small-town feel to it, and the parking lot was a vast, hilly, grass field, resembling those Deadhead parking lot scenes from the early 1970s. Because it was Kansas, the parking lot was almost entirely filled with out-of-state cars, trucks, vans, and buses. Sure, there were plenty of hippie vans painted in psychedelic colors, but beyond that were rows and rows of thousands of vehicles, almost all of which were on some sort of a concert-venue-fueled road trip. Since Deadheads will often spend all day in the parking lot before a show, I had hours to walk up and down the grassy rows, peering into, and sometimes even being invited into, hundreds of long-distance homes. There were old school buses with the frames of VW buses welded to the frame. There were hippie vans piled high with luggage and gear, and Jeeps that had everything needed for three months on the road, strapped down compactly in every scant empty space. I think that walking among those buses and vans was more of a road-trip education than reading any road-trip classic. To see a thousand vehicles bound on long journeys is to witness a thousand different road trip strategies. The lesson is that everybody organizes road-trip gear differently and approaches the trip in a different way. Seeing a thousand strategies is better than having one perfectly illustrated. Twenty years after seeing those Deadhead vehicles, I'm still learning from all my mistakes on the road. I've learned that a series of successive smaller, shorter road-trips, repeating a process over and over again, is the key to producing consistently successful and happy road trips. My system is based on the idea that my vehicle is an extension of home. Making your vehicle your moving home isn't so much about how you modify it so much as about creating that state of mind. For me, keeping it clean and organized, so that everything stays in its place throughout the trip, and repeating your rules to your passengers, so that they follow your system, is key. Everything has a spot, everything has a place. It's easy to be tempted to fill your vehicle with as much gear as possible. It's not like you have to carry it all on your back, after all. But over time, I've learned that you have to pack your vehicle with the same intention as when you're backpacking: Less is more. Forget bulky items and try to find tools that have multiple purposes. There is nothing worse than a cluttered road-trip vehicle. My first road trips were filled with clutter, even though I thought I was packing as minimally as possible. The more you get out on the road, spending one-, two-, or three-night weekend trips, the more you encounter trials and errors. The more short trips in your backyard, the better you're prepared for the longer ones, and the more you begin to feel completely at home, as if you are own a moving castle, out there along those lonely windswept beaches and dark, rain-drenched forests. This was originally published on and is republished with permission. is the travel blogger, photographer, and illustrator behind . He travels for the spark.